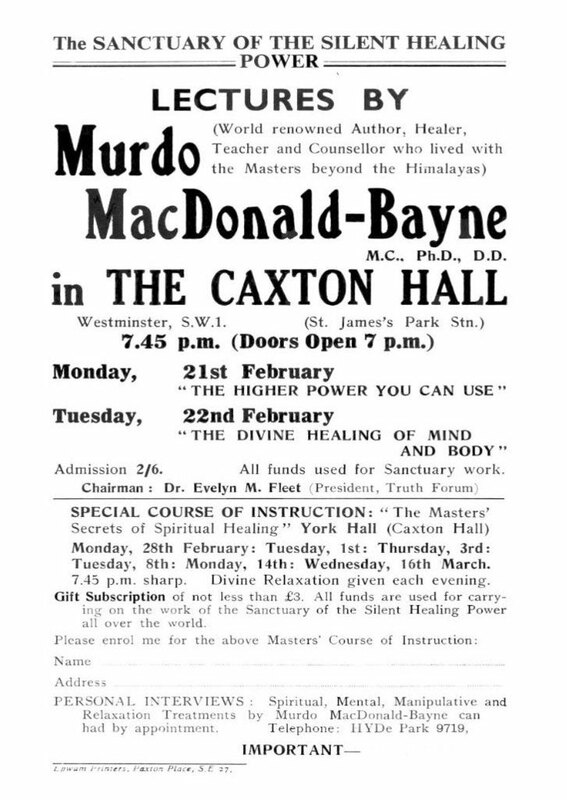 The student of Truth, having read some of Dr. MacDonald-Bayne's books and heard his recordings, would naturally wish to know more about the man who gave to the world so much wisdom, and in such simple language showed us how to apply the Law of Creation, the Law of Life. You must realize how difficult it is for one of his students and followers to describe what type of man he was for the simple reason that during the time he was with us in South Africa and throughout his teachings he always urged us not to make an idol of him, not to set him apart or put him on a pedestal. "Dr. Mac" as we still call him, taught us not to look at the physical being but to see the reality within every human being, for this invisible, spiritual reality is our true identity. Hopefully this article may help to give a glimpse of the man often referred to as "Master" by his pupils and students. 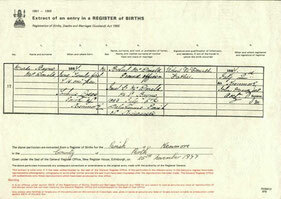 He was born the 21st day of June 1887, at Kenmore, Perthshire, Scotland, the second son of a landholder. He was named Murdo Bayne MacDonald, 'Bayne' being his mother's maiden name which he used as nom de plume. His early childhood was spent in the strict religious environment of a typical Scottish family and when only six or seven years old he had a very moving spiritual experience. He saw the features of the Christ on the closed window of his room. Frightened by this, he fainted. After the experience he found he could see and hear things of which other people were unaware. He found too that he could jump from a height and stop himself in mid-air and slow down to land gently. This was a yoga feat of which he learned more when he grew up. Yet it was also at that time when, going with his elder brother into the fields and jumping over a brook, he landed on a loose piece of barbed wire and one of the barbs penetrated his left eye. In hospital he was operated on by his uncle, who removed the eye and thereafter he always wore a glass eye. As a young man he entered medical studies which he found too materialistically oriented, preferring to deal with the health-giving processes of life in a more natural way. Later on in life he was bestowed with the degrees of Doctorate of Divinity and Philosophy. In 1913 he married and two sons eventually were born of this union. In 1914 when war was declared he joined the Highland Light Infantry and, being a champion piper, he was made "Pipe Major," serving throughout with distinction and earning his first commission on the 16th of September 1917 as Second Lieutenant, to become Lieutenant on the 16th of March 1919. He was honoured with the British War Medal, the Victory Medal, and the Military Cross. "During that period of time spent 'on the other side', I was instructed to return to my physical body, for my work was to tell the Truth to the world. When they came to remove the corpses for burial in a mass grave one of the ambulance men heard my groans and said, 'There's a live one here!' I was brought to the medical field station and immediately operated on. I heard distinctly the doctor mentioning that there was a possibility of losing the other eye and I decided in myself that was not going to happen. During the whole operation I was aware of what was taking place, although unable to speak, for one of the wounds was in the throat. So, out of the body, I assisted at the operation. 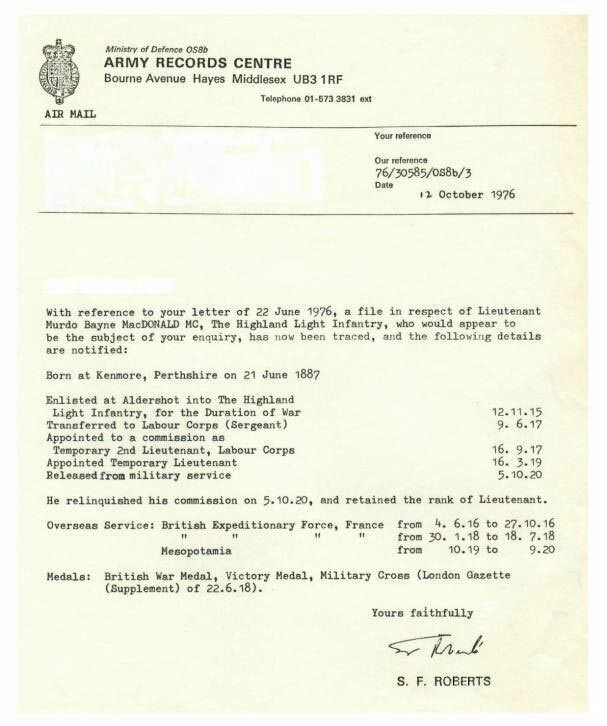 After recovery and convalescence I rejoined the Forces and went through the Near East campaign." 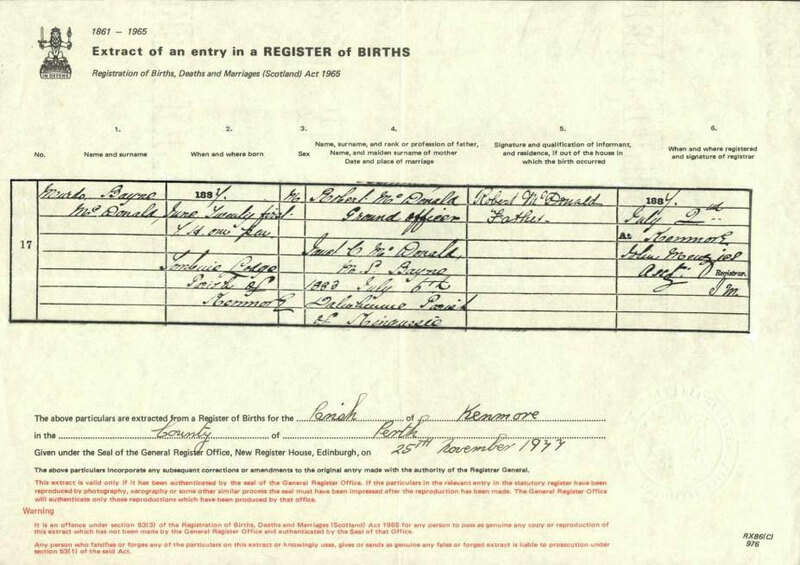 He was demobilized in 1920 with a Victory Medal then took his family to New Zealand and Australia, but as the children grew older Mrs. MacDonald-Bayne returned to England for their education. Dr. Mac with a hat. Dr. Mac started his Healing Campaign and toured some 23 countries giving lectures wherever he went as his mission was to teach and heal. At this early stage his teaching was more psychologically oriented, based on the theory that what you want and visualize you will get even if it is not suitable for your development. This attitude changed later after sojourns in India where he studied and mastered yoga, becoming proficient in the practice of deep breathing. Some of these exercises are given in his books and described in his recorded lectures. The College of Universal Science was started in Manchester, England during the 1930s where he taught metaphysics. Some of the original lectures he gave there have come to light in recent years and have been published in Canada (1984) by L. Mendel, titled, "The Supreme Power Course" (A Course of 22 Lessons) and this is available to the public. One day when in Edinburgh attending a seance he received a message to "Go to Johannesburg," where he was to do much spiritual work. He was then accompanied by his sister, Mrs. Chisholm, who kept house and took care of him, his wife and children remaining in England. 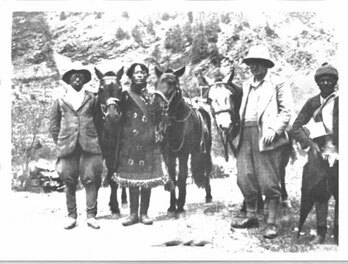 When he came to Johannesburg and Cape Town it must have been somewhere in the late 1930s for he taught and started a Healing Centre in Cape Town around that time. 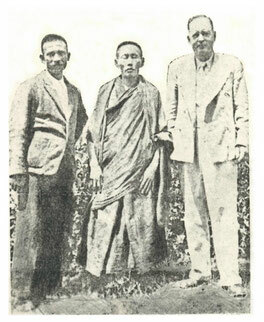 It was prior to this stage that Dr. Mac was given a spiritual message urging him to "Come to Tibet." His devotion, his relentless desire to know and find the Truth, the purpose of his being here on earth, developed in him a deep spirituality. So when the message came he left immediately, journeyed through India and reached the Himalayas. 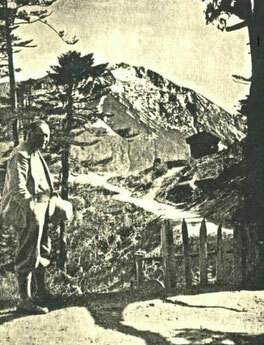 If you read his books, "Beyond the Himalayas" and its sequel, "The Yoga of the Christ" you will find details of his experiences and travels in Tibet, of spending time in study and practice of the higher spiritual instructions which he received from living Masters and which formed the foundation for his later teachings. 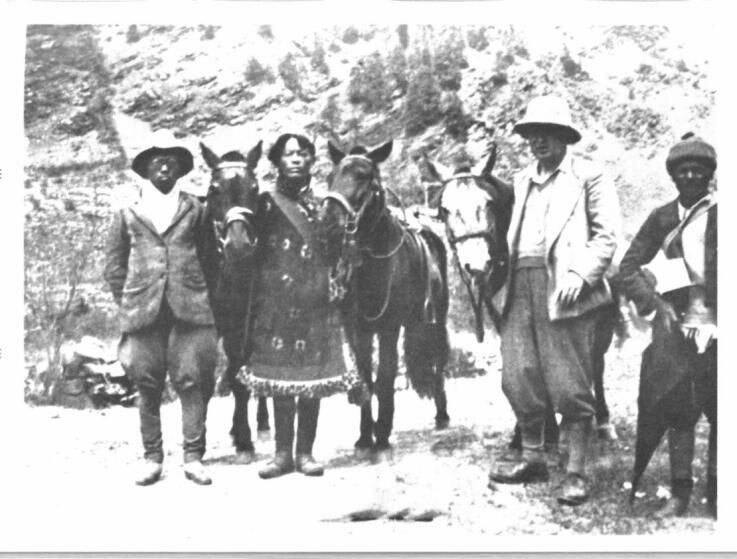 He travelled many miles through rugged Tibetan terrain, visiting lamaseries where he witnessed extraordinary feats and demonstrations of both a spiritual and physical nature. He developed his talents of telepathy and learned to leave his body at will, mastered pranayamaand acquired a profound knowledge of the Eternal and Everlasting Life through meditations of several days' duration. Upon his return to the so-called civilized world Dr. Mac resumed his travels, establishing further centres in Australia, New Zealand, Canada and the United States. Even today there are people in various countries who still remember his talks and healing sessions. Dr. Mac in the mountains. He was guided once again to go back to South Africa and one of his former students, Mr. Andrew Hutt, formally introduced the Doctor to public gatherings in Johannesburg and Pretoria around 1944. It was here he expanded his College of Universal Science and the Sanctuary of the Silent Healing Power, and in no time he became very well-known, lecturing twice a week, in Johannesburg on a Thursday and in Pretoria on Tuesdays, continuing in his healing work daily as well as constantly writing. His Monthly Letters (The Sanctuary of the Silent Healing Power)were sent out worldwide, bringing much help and guidance to many. It was in the mid-1940s that his talks began to be preserved on wire recordings of which there are over one hundred still extant. No one was ever refused help and many are they who can vouch for his powers of healing, even at a distance. He would appear at the bedside of a person who had asked for help, for he was able, as said before, to leave his body at will and appear at any place where needed. With the help of his spiritual teachers and the Masters of Tibet he did achieve some remarkable cures, some will say 'miraculous healings'. In many of his lectures Dr. Mac would break the tension by telling a joke or some amusing anecdote from his experiences. One incident he related was of a man one day who came to see him and complained about the pains in his knees. "Can you bend your knees?" asked Dr. Mac. "No," said the patient, "and I cannot pray anymore." "Why? Do you kneel to pray?" he asked. "Yes, and now I cannot pray. . . . But how do youpray if you do not kneel?" inquired he. "My life is a constant prayer," replied Dr. Mac. Dr. MacDonald-Bayne's teaching, based on the words of the Christ, is simplicity itself - the knowing of the self, the knowing of the laws of creation, and the freeing of the mind from all conditioning and limitation. When we free the self we find Peace within, and then reality manifests. Therefore, our understanding and relationship with others is the first step, then comes the realization that we can never be separated from Reality which is Life, God, the Creator. He related cause to effect and then gave us the key to the solution of all our difficulties, which is to become consciously aware of our Real Self, at one with Infinite Reality, I and my Father are One. He told us that after his death and a period of inactivity his teachings, books and recorded lectures would spread throughout the world. This appears to be what is happening now - a revival! 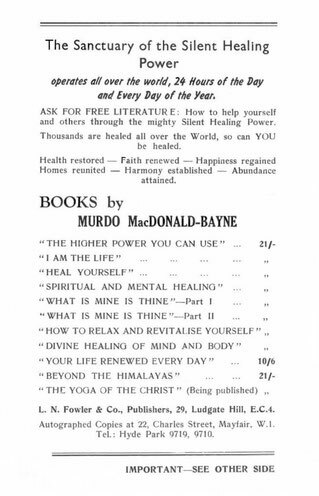 Dr. MacDonald-Bayne was the author of several books based upon his lectures given on healing, health, and Divine wisdom. 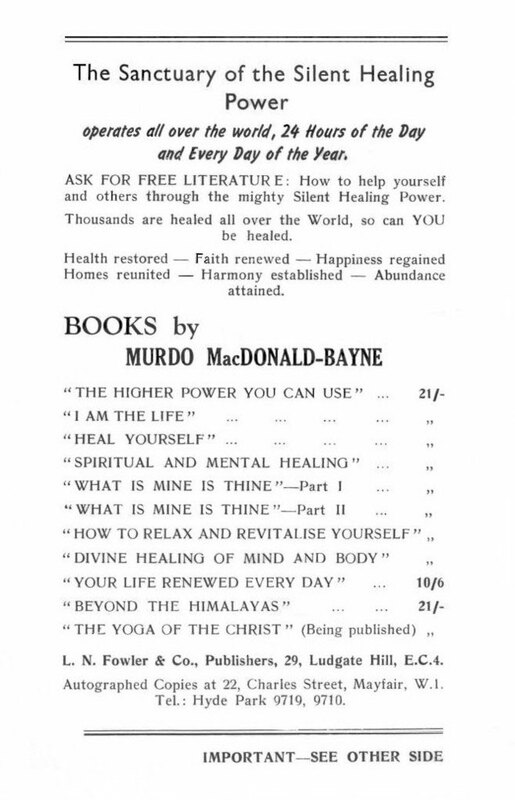 The most notable is "Divine Healing of Mind and Body" (The Master Speaks Again), a series of lectures that took place in 1948 when he was overshadowed by the Master who once again brought His age-old message to us given 2,000 years ago of our oneness with the Father. A few of the book titles based on the Collected Writings of MacDonald-Bayne, published posthumously in Canada, are: The Supreme Power Course (A Course of 22 Lessons); The Sanctuary of the Silent Healing Power, Monthly Letters (Books 1, 2, and 3); Commentary Notes to the Higher Power You Can Use; Your Silent Partner - Cosmic Consciousness, Parts 1 and 2; "Transcripts" for the recorded lectures (16 volumes of 10 lectures in each), were published in Canada, from 1984 to 2002. Also, the original wire recordings which were transposed in 1979 by Lora in Canada are available on cassettes. Dr. Mac gave his lectures in Johannesburg at Escom House where an average of 250 people attended weekly. It was there that he gave the series of talks in 1948, presented in his book "Divine Healing of Mind and Body" (The Master Speaks Again), during which he was overshadowed by the Master. In Pretoria he started lecturing at the Jewish Memorial Hall on Beatrix Street and moved later to the Hall at the Women's Club where the new Sanlam Centre is today, at the corner of Andries and Pretorius streets. We were about ninety pupils then. During his lectures in Pretoria he would stand and ask us to be still, and as we watched his whole appearance changed. He became taller and a lightwould surround him. His face changed as well. Some of the pupils said afterwards that it was the face of Jesus which appeared. It seemed that each one of us, according to his sensibility, saw someone take over; definitely his stature and face did change and the light was certainly not the normal lighting in the hall, for it was a light emanating from the body of Dr. Mac himself. It was really an amazing experience and quite new to most of us. Only a handful of us here in Pretoria are still living and carry on with his teachings. A small group continues to meet regularly to read and study his lectures. Dr. MacDonald-Bayne was a wonderful man, a great teacher and a very humble healer, using the tremendous healing powers vested in him for the good of all, applying spiritual, mental and sometimes physical means to achieve the best results. 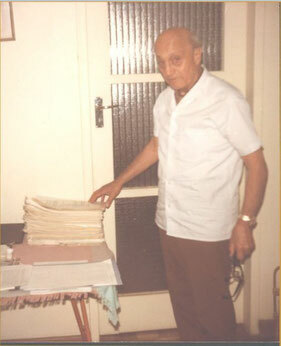 He was a pioneer of homeopathic treatment in South Africa. For us, his pupils, he remains our 'Master.' Often he said to us, "I have chosen you, you have not chosen me." A brief physical description of him is as follows. He was of medium height, about 5 ft. 7 inches, well built with broad shoulders, a rather round face, clean shaven with a pencil-thin mustache, and even though he went through life with the use of only one blue-grey eye, you could feel the tremendous power of his piercing gaze. Always smiling, ready to crack a good joke, he was easy to approach and full of life, relaxed, yet forceful in his talks. He never looked more than 45 years of age and yet in fact he was nearing 70. He was a gifted medium and was at all times in contact with the best mediums of his day in the world, most especially in England, Australia, New Zealand, and South Africa. 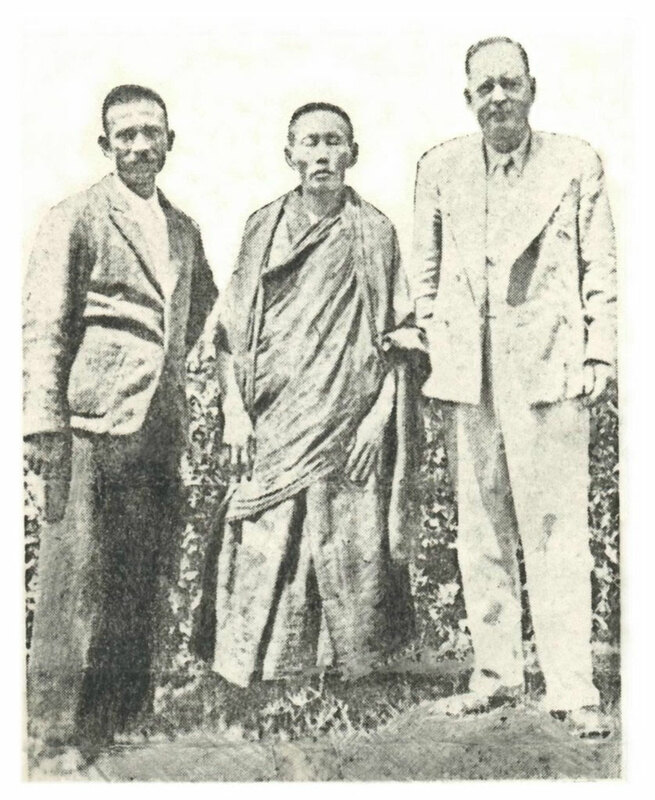 During his healing ministry the Doctor aided thousands by his wisdom and practical guidance, and his remarkable control of spiritual forces was such that he consciously made full use of his powers to fulfil the purpose of his earthly mission. Many patients reporting from New Zealand, Australia and a host of other countries, stated that Dr. Mac would appear at their side or at the foot of their bed and they immediately felt an improvement in their condition. 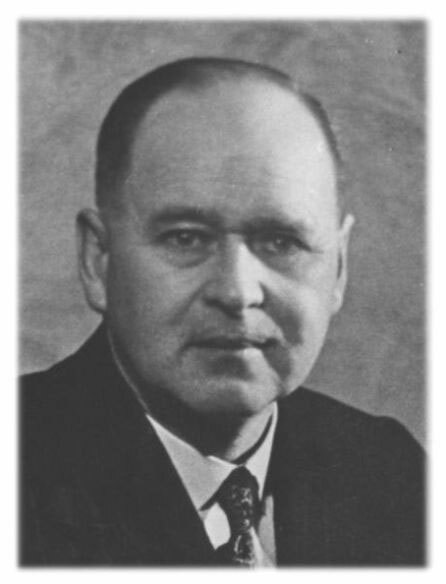 During his stay with us in South Africa, Dr. Mac once or twice spent a holiday in the United Kingdom and it was therefore no surprise for his students when in 1954 he announced his intention to go to England for six months to visit his family. 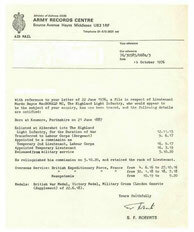 The intention was to return in early 1955. 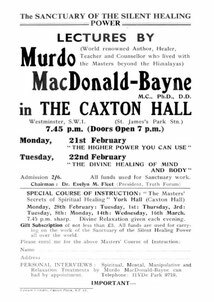 So it was that in London he gave two wonderful lectures which were his last, on the 21st and 22nd of February 1955, at Caxton Hall. He was still devoting up to 19 hours a day to spiritual duties, healing work and writing. On the 26th of February 1955, while returning from a show with his sister, Mrs. Chisholm, Dr. Mac died of a heart attack in a taxi in London. Strangely enough he had written and sent out his usual Monthly Letter throughout the world to all students, followers and patients. His legacy to the world was his dynamic teachings of Truth. Read his books, his lectures, listen to his recordings, and you will learn much of the secrets of the Masters. In his straightforward and enlightened manner he demonstrated profound knowledge of humanity's imperfect struggles to gain more understanding of themselves and of life. He gave of himself unstintingly to all. Through him the Love and Wisdom, as demonstrated to us by Jesus the Christ, was adapted now to the thinking of new generations, the New Age. With sincere study and application of his teachings we shall be able, each one of us, to reach the goal set for all, the 'Kingdom' within. By consciously changing one's life inwardly, one can learn to become a clearer channel through which will flow the great spiritual forces of Life - the Love, Wisdom and Power of the Infinite God Our Father. Go in peace my friends, enjoy your studies, and they will fill your heart with a love beyond human concept. It is the Christ-love of God and Man.